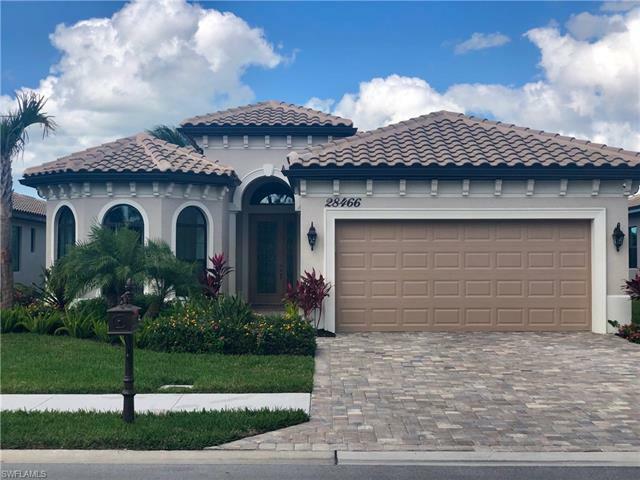 28466 Tasca Dr, Bonita Springs, FL.| MLS# 219012724 | Southwest Florida Residential Real Estate for Sale. HOME HAS WOW FACTOR. DESIGNER HOME. UPGRADES GALORE. AMAZING SUNSETS, ON LAKE WITH FOUNTAIN. OPENS TO GORGEOUS LANAI WITH SALT WATER POOL, 18" SPA W LED, CUSTOM BUILT OUTDOOR KITCHEN. CUSTOM OUTDOOR BAR W LED. BAR HAS TV's. OUTDOOR DINING AND SITTING AREAS WITH TV. OUTDOOR SITTING AREA W FIRE PIT. ENTIRE HOUSE IS FURNISHED WITH HIGH END FURNITURE THAT IS NEGOTIABLE FOR A TURNKEY PURCHASE INCLUDING NEW GOLF CART. CORDOVA AT SPANISH WELLS CLUB SOCIAL MEMBERSHIP INCLUDED. GOLF OPTIONS AVAILABLE. APPROX 3 MILES TO GORGEOUS SW FL BEACHES. WELCOME TO YOUR ULTIMATE FLORIDA DREAM HOME.